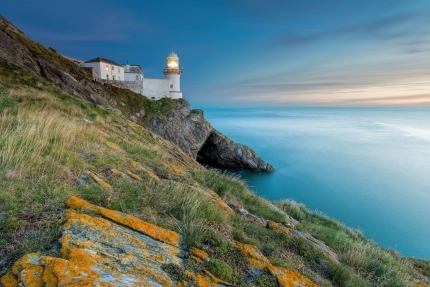 County Wicklow also known as The Garden of Ireland is renowned worldwide for its charming beauty. Wicklow is a hiker’s paradise and is home to the Wicklow Way, Ireland’s oldest waymarked walking trail. This popular guided walking holiday takes you through Ireland’s largest National Park in central Wicklow, part of Ireland’s Ancient East. Wicklow Mountains National Park manages and protects some of Europe’s oldest bog lands, heather covered mountains, broad-leafed and coniferous woodlands. It offers a vast diversity of scenery; from woodlands and rolling hills to lush green valleys, streams and lakes. The area provides habitat for native species including sika and red hybrid deer, foxes, badgers, hares and birds of prey. A highlight in the area is a visit to Glendalough, certainly a famous and important monastic settlement where we will walk in the footsteps of St. Kevin. The imposing round tower overlooks a scene of exceptional natural beauty. Glendalough, meaning a valley of two lakes (Gleann Da Loch) is a landscape imbued with the spirituality of its illustrious past. Staying in one central location gives you maximum flexibility, join the walk or stay behind and visit the spa. Staying at this award winning lodge, you can take a day off and enjoy the local services, perhaps a massage or simply relax and enjoy the scenery. This the perfect blend of being active and indulgent.